(Newser) – With the dust settling on Super Tuesday's contests, analysts are taking a close look at the delegate math—and it doesn't look good for candidates not named Clinton or Trump. 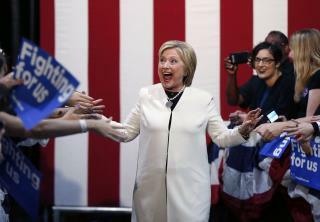 With 2,353 delegates needed to win the Democratic nomination, Hillary Clinton gained around 457 delegates on Super Tuesday, giving her 1,005 delegates, including superdelegates, according to the AP. All I want to know is how the FBI INVESTIGATION on HIL(LIAR) is STACKING UP! Hmmmmm... There ya go ALL!! She has a 15 point lead over Sanders in my own state of California. This is important because everyone seems to be going for the establishment candidate. Come general election, I will be enjoying the Hillary slams, being a democrat for Sanders. I guess that works both ways, because I would be very unhappy to read all the unjust slams on Sanders if he was the one. He says, 'I will do this', she says, 'we'll take a look at it.. He's a doer, she's a promiser. Winning his home state by blowout shows that they know their man. The country just never had the time to know him like they did. We could say, well, he can always run in 8 years, but that wagon has already left the station, as he's too old for that. She may offer him a cabinet appointment, but he won't take it. because he's a man of principle.